I completed the latest pattern for inclusion in the next volume of the shoji and patterns. This one is called mie masu-tsunagi. I showed the masu-tsunagi pattern in blog entry about a year ago. The word masu (升 or 枡) means a measuring cup used in Japan in the past to measure liquids, or rice and other grains. It was cube-shaped, so the top formed a square, and by extension, masu in this case means a square. Tsunagi means connecting or joining. 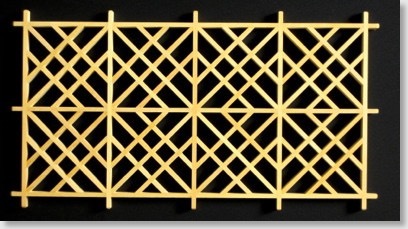 So the masu-tsunagi is a series of interconnecting squares or a connection of squares; mie means triple, so this pattern is a series of three interconnecting squares, and if you look hard enough you can see the squares grouped in threes. 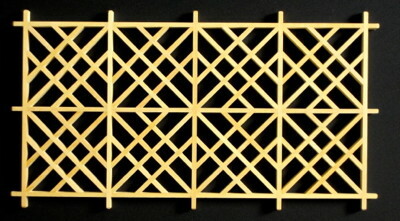 This type of pattern is used for feature bands in a shoji, or as a top and bottom border pattern. It would also look quite stunning in a ranma arrangement.